It can be quite frustrating waking up in a cold winter morning and finding your car covered in snow or ice, especially if you’re ill-prepared for the task that follows. Although improvised tools may work reasonably well for snow, when it comes to ice the situation changes dramatically. 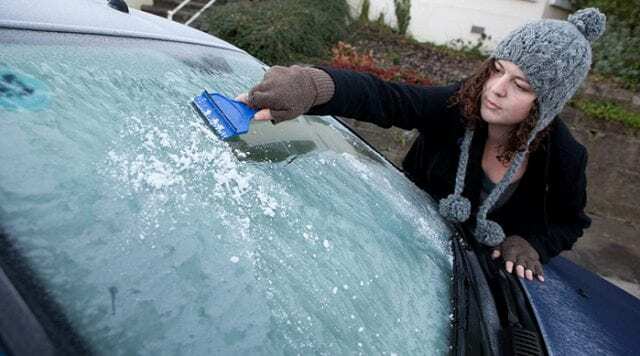 This is because ice removal requires the use of sharp objects, which for the sake of your windshield, need to be specially designed for the job. This is where ice scrapers come into play, as they are purposefully designed to be easy to handle, practical, and guaranteed not to scratch your car’s windows in any way. Let us then find out what are the ten best ice scrapers out there and what exactly are we supposed to look for when buying one. Made with a sturdy 4.5-inch wide blade, the AmazonBasics Ice Scraper is a heavy duty tool built to remove ice and snow from car windows. Featuring an additional ice chipping blade at the side of the scraper, it helps to break up thick ice, enabling quick and easy removal. Measuring 10 inches in length, this ice scraping tool comes with a heavy-duty plastic construction with a durable foam grip that offers optimum comfort while scraping. 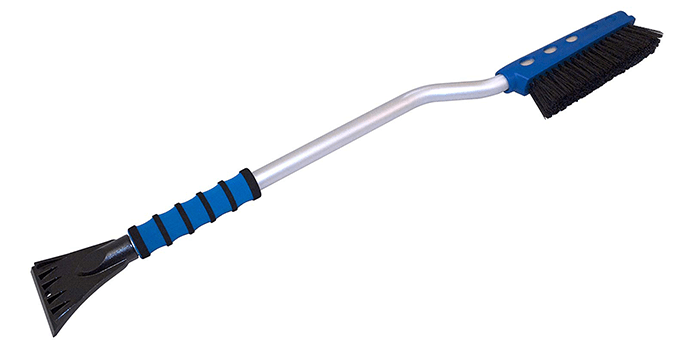 It also features a thumb rest that allows users to scrape and remove ice with added leverage and ease. Crafted and designed with premium quality oxford material on the exterior, the MATCC Ice Scraper Mitt is resistant to water and keeps the snow and ice away from getting in through the wrist band, ensuring your hands stay dry. Featuring a thick lining made from fleece, it keeps your hands snug and warm and makes sure the wind does not get in. Light in weight yet extremely durable, the glove comes with a sharp blade located at the edge, made with plastic, featuring a flute construction that cuts through the toughest layers of ice and snow. Suitable for all hand sizes, this glove comes with an elastic band on the wrist to ensure the mitt does not fall off or slide off while removing ice and snow. Thanks to its wide 10-inch scraping blade, the Mallory S24-994 Maxx XS Ice Scraper enables fast and easy snow and frost removal from your windshields. Constructed with sturdy ice chippers at the edge of the blade, it helps in breaking of thick and tough ice with ease. Featuring a heavy duty grip made with soft contoured foam, it offers optimum control and comfort while scraping and breaking the ice. Known for its quality, durability, and portability, this ice scraper is the ideal tool to carry in the trunk of your vehicle. Made with premium grade, sturdy ABS plastic material, the Jelaty Snow Ice Scraper is a durable tool that is resistant to frost and built to last. Designed with the ability to remove the toughest, thickest layers of ice and snow, it comes equipped with sharp blades that do not leave any scratches or marks on your windshield. Featuring a thick sturdy handle with a soft foam grip, this snow tool offers comfort and optimum control and is ideal for both women and men to use. Light in weight, sleek in design, and highly portable, it measures 13″ by 4.3″ by 1.3″ and is extremely convenient to carry around. Known for its premium quality and high performance, the Hopkins 16721 SubZero Bear Claw Ice Scraper features a 4-inch wide sharp blade that is designed to clear frost and ice. Crafted with a flat, sleek construction that allows easy storage, this ice scraping tool is ultra-durable and built to last. Equipped with tiny ice chippers on the blade, it allows users to quickly break and remove all traces of ice with ease. 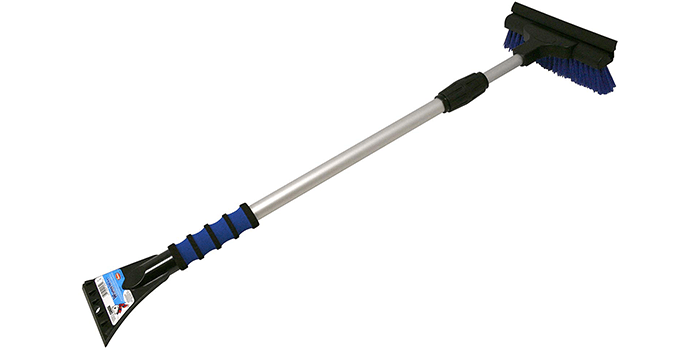 Measuring 10 inches in length, it provides a good extended reach. Equipped with an extra-large brush head measuring 8.5 inches wide, the Mallory 581-E Telescoping Snow Broom with integrated ice scraper is the ideal tool for clearing heavy snow. 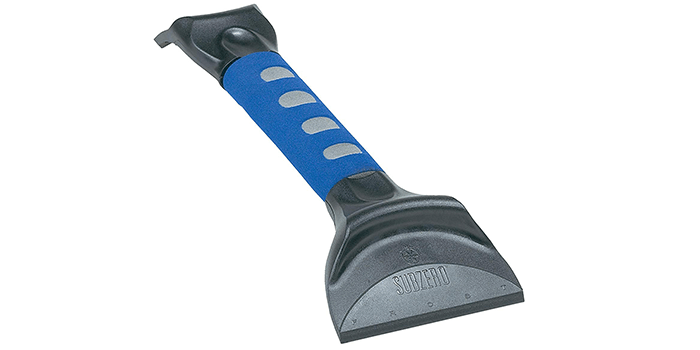 Featuring a heavy-duty rubber squeegee it helps in the removal of excess moisture. Measuring 30 inches in length, it extends to 48 inches and provides users with a better reach. Along with the durable brush head, this tool comes with a sturdy ice scraper that is designed with ice chippers that can quickly and easily break the ice. Designed with a sturdy grip made with soft foam, this ice scraping tool offers optimum levels of control and comfort while removing ice, snow, and frost. Thanks to its extended length and heavy-duty construction, the Mallory 999CT Ultra MAXX 35″ Snowbrush comes equipped with an ice scraper that enables removal of snow and frost from hard to reach areas. Light in weight, made with high-quality aluminum, this ice scraping tool offers stability and ensures you do not face any arm fatigue while removing snow. 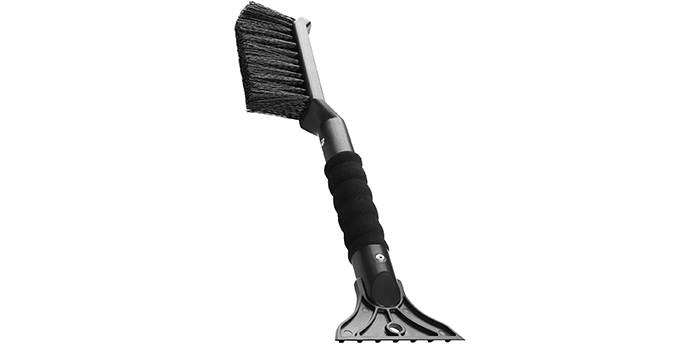 With a brush-equipped with 5 rows of premium grade bristles, it helps to remove the thickets layers of snow with ease. 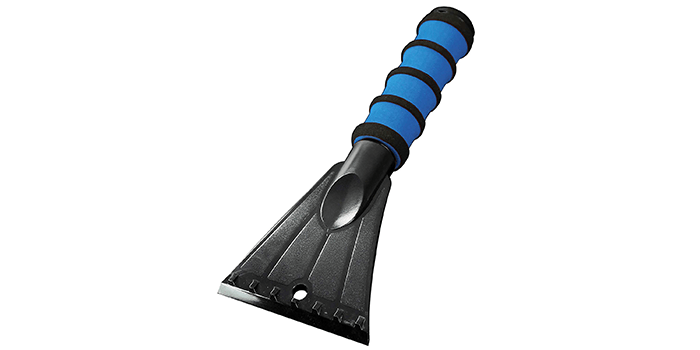 The scraper blade is wide and breaks through thick and stubborn ice, while its contoured grip made from soft foam offers optimum control and support. Measuring 27 inches in length, the Mallory 533 SnoWisp Deluxe Snow Brush is a premium quality tool that comes along with an extended ice scraper. 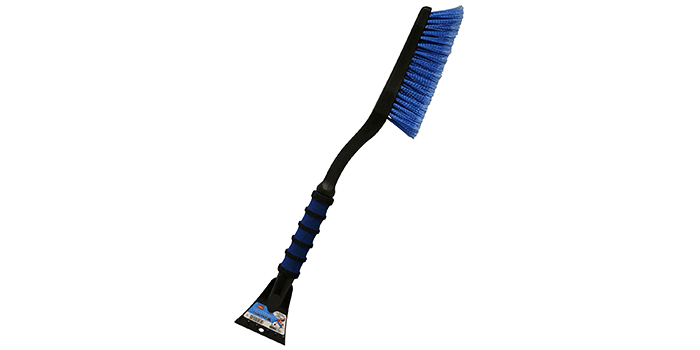 Featuring 4 rows of sturdy, durable bristles, the brush helps with easy removal of ice and heavy snow from your car windshield. 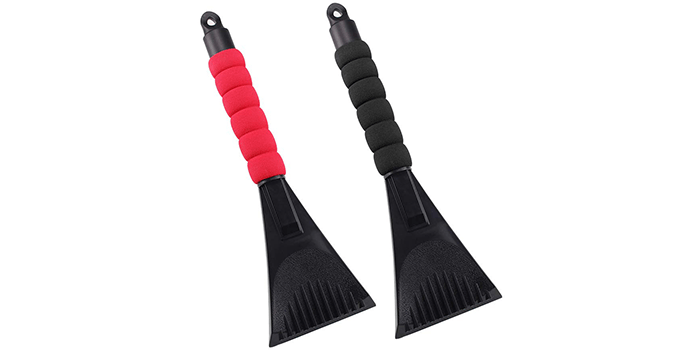 The ice scraper features a 4-inch wide blade designed with ice chippers that allow users to chip and break through thick layers of ice with ease. Featuring a soft, comfortable foam grip that is uniquely shaped to give you optimum hold and control, this tool is great for utilizing in the toughest weather conditions. The OxGord Ice Scraper is a 2-in-1 snow tool designed with an ice scraper along with a brush that allows quick and easy removal of frost and ice from your windshield. Constructed with premium grade, durable materials, this tool can withstand the toughest and thickest layers of ice. Equipped with inbuilt snow picks, it helps in the easy breaking of thick ice, while its comfortable handle with a soft foam grip offers optimum support and hold. Compact in size and light in weight, this tool features a sleek design and can be stored in any corner with ease. 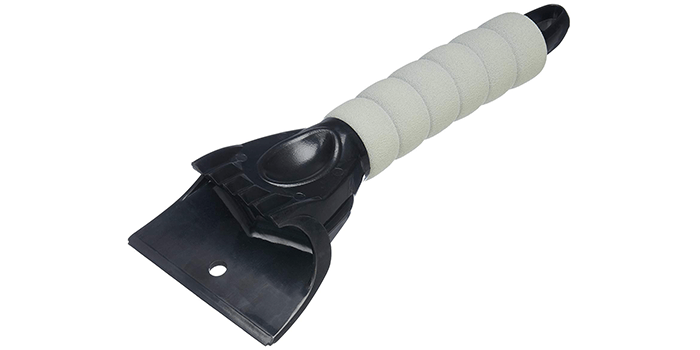 Built with a high-quality, durable, 4.5-inch blade intended to remove all traces of snow and frost, the Hopkins Subzero 16621 Ice Scraper is a heavy-duty ice removing tool of the highest quality. Equipped with ice chippers on one end of the scraper, it helps break up the heaviest, thickest ice. Made with premium grade materials, it comes with an oval-shaped foam grip on the handle of the scraper that offers optimum levels of comfort while holding. 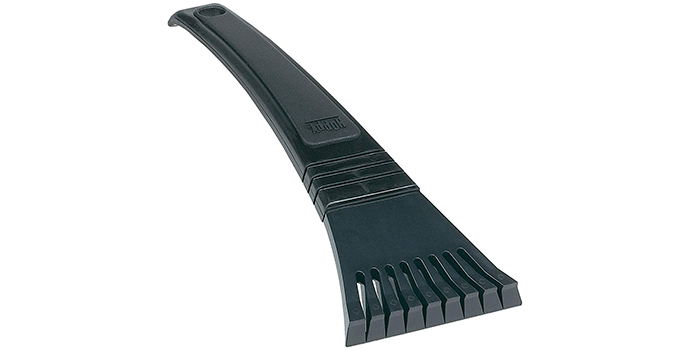 Measuring 11 inches in length, this ice scraper helps provide optimum reach without having to stretch too much.